Breeze through majestic Niagara Falls. The MistRide Zipline experience is rightly named 'Flight without feathers'. Niagara Falls have a brand new attraction to woo tourists. If the majestic falls weren’t enough an enticement, now there is WildPlay’s MistRider Zipline. It takes your Falls experience to a whole new level as you zip through a 670 meters (2,200 feet) long zip ride from the Niagara Parks Grand View Marketplace to the historic Ontario Power Company building situated within the Niagara Gorge. 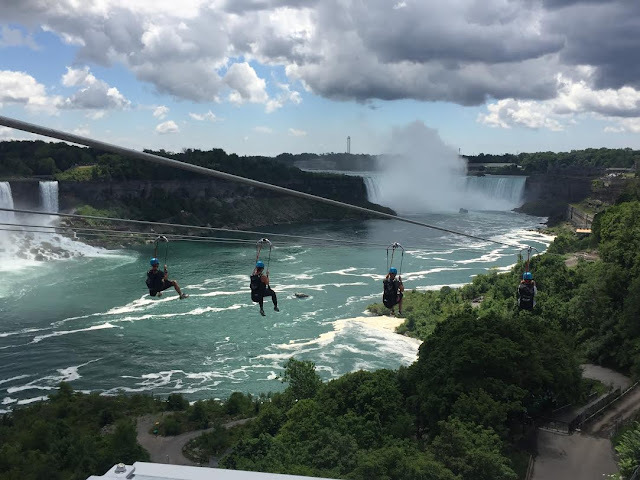 WildPlay’s MistRider Zipline to the Falls lets visitors soak in breathtaking views of Niagara Falls from close and makes the entire Niagara Parks experience a memorable affair. You can enjoy Wildplay’s MistRider Zipline to the Falls or WildPlay’s Whirlpool Adventure course that is also opening shortly. The Zipline to the Falls is an experience like no other. Four parallel lines facing the American and Canadian Horseshoe Falls let riders enjoy the scenic beauty while hanging from 220 feet high vantage points. You get the adrenaline rush as you zip across at a speed of 70 kmph. WildPlay is no novice to developing such exciting yet extremely safe ziplines and has already five similar locations with a variety of challenge and thrill-based experiences in western Canada to its credit. It also consults on outdoor adventure projects across North America and the Caribbean. WildPlay’s MistRider Zipline to the Falls will operate from July until late October 2016.